The Balanced Scorecard has achieved almost universal acceptance – but failure rates of up to 70% have been reported. So what are some dos and don’ts to heighten the probability of success? Do ensure your strategy passes the 7 Point Test. Do involve a wide range of staff in measure creation. Do validate a link between measures and desired outcomes. Do Empower, Enable and Encourage. Don’t put stretch targets before learning targets. Do develop systems to produce the scorecards. Don’t expect staff to manually prepare scorecards. Do be good at analysing trends. Don’t leave the scorecard measures out of the planning process. Do include measures that encourage innovation and opportunity taking. Do re-validate the effectiveness of measures annually. Don’t rely on the scorecard for all your information needs. It has been two years since I published my first review of the Balanced Scorecard performance management tool – Balanced Scorecard: Success without the pitfalls. During the following two years, the Balanced Scorecard has become even more popular and some research is now available that examines its effectiveness. But it is clear that not every Balanced Scorecard project is successful, indeed reports of failure rates as high as 70% are to be found. Mike Hammer, founder of the “re-engineering revolution” notes that few managers and employees feel that the performance metrics and goals they use are the right ones and actually help the organisation achieve its goals. At the same time, the whole issue of performance management and “management by targets” has experienced some bad press. Ed Balls, when right hand man to then UK Chancellor Gordon Brown, admitted that centrally driven targets can “sap morale” and “destroy innovation and experimentation”. His colleague, past UK Health Secretary Patricia Hewitt, observed that centralised targets can be crude and risk distortion of priorities. Others have said that performance management created but also nearly destroyed Western manufacturing industry. So, this appears to be a good moment to take a fresh look at the Balanced Scorecard. In this briefing I have included most of the material in my earlier work and added new findings, including a self-complete evaluation questionnaire to help you review your own Balanced Scorecard or performance measurement project and keep it on course. It is reported that over 50% of Fortune 1000 firms now use the Balanced Scorecard methodology. Around 85% of organisations have adopted a performance measurement initiative of some form. As a consultant I have helped to implement the Balanced Scorecard and found that it has acted as a catalyst to assist staff to see their jobs and parts of the outside world from a totally new and more dynamic perspective. Importantly, it acted as both a catalyst and as a platform for learning. * What are the common pitfalls when designing, implementing and maintaining the Balanced Scorecard? * How can a Balanced Scorecard project be evaluated? * Is the Balanced Scorecard a self-contained panacea for all management ills in the 21st century? But first of all, a refresher of the Balanced Scorecard concept. 1. Outcome focus. Established financial indicators such as turnover and profit before tax are outcome indicators. They only alert us when things have gone wrong and the effect is being felt by the business and in the balance sheet. Such indicators and measures don’t provide us with an indication of when things may go right or wrong in the future. In short, these approaches are lagging not future looking or “leading” indicators – they do not provide us with an early warning system. 2. The drivers of business success. Financial measures alone do not assess and measure the parts of the organisation that create the future customer value that in turn delivers profit. A more holistic approach is needed that helps managers – like physicians – to examine the state of health of the entire body corporate. 3. Strategy into action. I have raised this failing in earlier briefings. Many business plans paint favourable future financial returns but don’t explain explicitly what must be done to achieve the planned returns. A well-managed Balanced Scorecard project will identify and measure the key actions needed to deliver planned performance. A properly constructed strategy map, success map or action-profit model (more of this below) can help to fill the gap and help a wide range of audiences within the organisation to understand what has to be done to achieve long-term goals. 4. Strategic communication, involvement and ownership. Traditional, financially based plans are difficult to communicate across the organisation. I always remember, when I was a manager, giving a presentation looking at the future objectives of my company and at the end someone put their hand up and said “Excuse me, but what does the word ROCE mean?” I had forgotten that ROCE (return on capital employed) was a technical term used by very few people in the company. The fact is that most business strategies are not communicated in ways everyone can understand. It all starts at the bottom in the “Learning and Growth” perspective. Skills, culture, leaders and management information that are aligned to the organisation’s strategy will create effective and efficient business processes – as shown in the “Business Process” perspective. Effective and efficient product delivery, customer relationships, innovation, and regulatory processes in turn make sure that the organisation’s offerings meet the needs of customers. The components of the organisation’s offerings (products, services relationships and brand) are shown in the Customer perspective. Satisfied customers and efficient business processes combine to produce growth, lower costs and better use of the organisation’s capital – the result being increase in profits and shareholder value. * Holistic – all critical areas in the organisation that produce financial outcomes are assessed. In addition to the financial dimension, we have identified the three key parts of the organisation that inter-lock to deliver shareholder value. * Forward looking – failure to meet say, skill acquisition targets, is a leading indicator of future failure in processes, customer satisfaction and ultimately, profits. * Easy to communicate – strategy can be easily explained and communicated. The illustration above is the basis for a strategy map – a series of initiatives that must be completed to achieve the objectives in the organisation’s business plan. A simple and visual way of communicating what the organisation plans to do to meet its financial objectives. 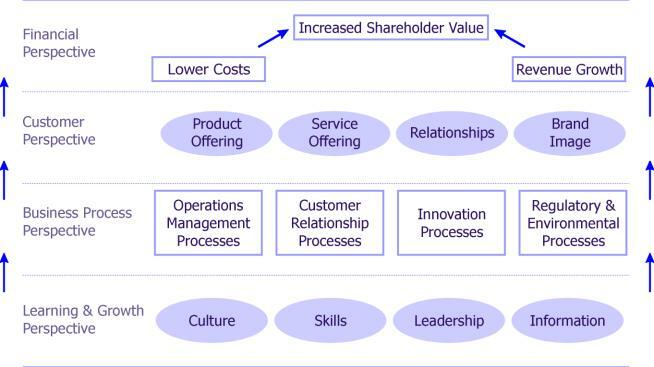 * Based on measuring four key dimensions – Learning and Growth (people, skills, culture, leadership and information), Business Processes (embracing four processes – product delivery, customer relationships, innovation and adherence to regulatory and broader environmental needs), Customer Offerings and Relationships and finally Financial embracing key financial objectives. The key to the success of the Balanced Scorecard is its simplicity – essentially seeing an organisation from four key perspectives – one driving another. Financial results are driven first by people. People with the right skills, motivation and information create effective and efficient processes, which in turn deliver products, relationships and services that create value for the customer. Customer value in turn delivers profit to meet the organisation’s financial objectives. What are the common pitfalls when designing, implementing and maintaining the Balanced Scorecard? The answer is “quite a few…” and we will look at these in the next section. Pitfalls and critical tasks can then be classified against each of these lifecycle stages. Have we got a strategy? The first immediate issue that we are concerned with is “do we have a strategy?” It is impossible to even consider a Balanced Scorecard or other performance management project if the organisation has not comprehensively developed its strategy. Broadly, an ill-defined strategy produces a vacuous and confusing scorecard. You must either have worked through the strategy process (as summarised in my briefing Its Strategy Time Again 2) or you must incorporate a similar strategy-building element right at the beginning of your Balanced Scorecard project. Failure to define and articulate a clear strategy will lead to an ambiguous and confused scorecard – and importantly one that lacks the thread of strategic consistency as the scorecard process is rolled out across all areas and functions in the organisation. When you think that you have created a strategy apply my seven point strategy test (see www.drrobertdavies.com/what_is_strategy.htm ). And it’s at this point that research tells us that typically we have a problem – 60% of organisations do not have a link between strategy and budget creation. Are we clear how our strategy will create value? Just having a strategy isn’t good enough. The key steps and changes necessary to implement the strategy must be worked through at least at a high level by the top management team. Research tells us that this is a commonly omitted step and potentially a major pitfall. Strategy maps can help. 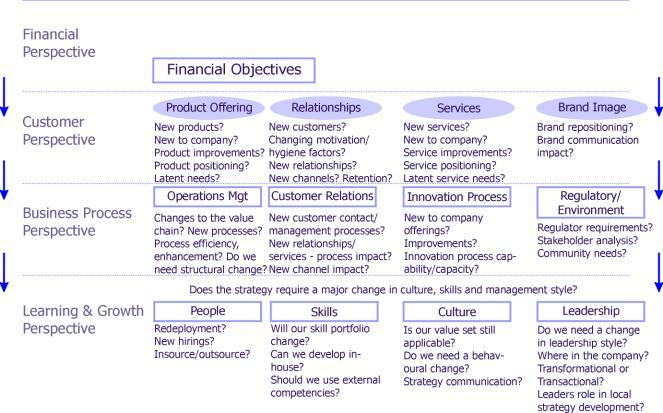 At their simplest, strategy maps take each of the four perspectives introduced above (Learning and Growth, Business Processes, Customers and Financial) – and set out a series interrelated actions that will ultimately deliver the strategic objectives, financial results and finally value for all stakeholders. Can we create a robust link between measures and desired outcomes? Another topical story here. The Times 13 November 2007 in its front page article reported that poorly constructed targets – or measures – were having a potentially detrimental effect on the UK’s Police Force. Simple measures such a targeting Police on an overall conviction rate without a weighting for the seriousness of a crime had been introduced. Result – Chief Police Officers were worried that activities were being focused on simpler crimes rather than potentially more serious and complex organised crime. The strength of the Balanced Scorecard is also its Achilles’ heel. The Balanced Scorecard is proving to be a powerful shaper of behaviour. But if organisations do not divert the effort into validating measures – creating a proven linkage between measures and outcomes – disaster could strike. Observers hold that it is in the area of this measure validation that the most progress has yet to be made. In short, organisations are putting too little effort (if any) into measurement validation. Do not rush the development of measures and be careful not to throw in a few that come easily to hand – you might stimulate actions and behaviour you hadn’t anticipated! So you must be confident that the measures you choose will produce the actions that will in turn deliver the results that the organisation is looking for. Remember too, there is evidence that in organisations that go to the trouble of testing the validity of the measures have higher profits than those that don’t. Fact. It’s unlikely that top-level managers are the closest to the customer. Top-level generated and enforced measures are a real problem as I have identified earlier. In addition, don’t use individuals on their own to develop measures and, as a rule, do not let single departments or teams develop measures on their own. If you do, your measures will be dominated and shaped by Group Think and will reflect an isolated and probably artificial view of the all important real world. “Stretch targets” are very fashionable. Going where the organisation hasn’t been before or the demand to deliver apparently staggering, impossible to achieve levels of growth. I am not going to criticise stretch targets here, but again research shows that there is a certain order to things. Learning targets that equip the organisation with the ability to consider, analyse and achieve stretch targets must be set and achieved before the stretch targets themselves are imposed. Incorrectly implemented, stretch targets can be destructive. Before imposing a stretch target consider the competency levels needed to implement it. Always reflect on this question first “To achieve our objectives, how must our core competences develop and change?” If it means taking someone or a team where they haven’t been before, think about creating a learning objective that will create the competences needed and measure its achievement before imposing the stretch target. Whilst writing this briefing an obvious problem crossed my mind. A properly constructed Balanced Scorecard can help the organisation focus on one external element of the all important competitive environment – the customer. But what about the other forces that could reshape your market – new entrants, technology, emerging legislation, environmentalism? Typically, you won’t find measures that judge the volatility of the outside world and omitting these can lead to the development of another Balanced Scorecard “Achilles’ Heel” – an inwards as opposed to an outwards focus. Scorecards, by their nature, tend to focus on internal as opposed to external to the organisation issues. It is a common temptation to develop Balanced Scorecards with too many measures. Try to stick to between 20 – 25. Any more and it won’t be used as part of day-to-day business management. As is the case in any project, the implementation phase carries specific issues to consider. Like any other major initiative there has to be total commitment. It’s the old case of management and leadership by example. If the entire team doesn’t believe in it – persuade them or don’t do it. Some readers may remember another process for guiding the organisation to strategic success – Management by Objectives (MBO). MBO was consigned to the recycle bin of failed management panaceas over 25 years ago. The major reason for its failure was an issue of management style. Remember that the Balanced Scorecard is not (i) a tool for imposing a strategy created at the top of the organisation or (ii) a stick to beat people with. It is actually a tool to allow people to both participate in the strategy process and to create objectives and measures that reflect their business area’s efforts to support the broader corporate strategy. MBO failed due to a highly centralised top-down “stick to beat you with” style. The one thing that I am sure of is that the business world does not evolve in a rational straight line. The problem is that many Balanced Scorecards assume that the business world does evolve in a predictable way. As we have recently learnt, economic cycles have not yet disappeared. With these observations in mind, many writers now propose that a successful strategy consists of the creation of a portfolio of opportunities. So we have to allow space for opportunistic behaviour. Don’t focus all measures on the achievement of objectives set during the annual planning and budgeting process. Allow space to assess local idea generation and the ability (and encouragement) to seize opportunities as they arise. Remember that the Balanced Scorecard will create a need for data that cannot be sourced from existing financial information systems. This is both a strength and a weakness. It is a strength, as it is part of a process for building a better, more holistic information gathering system that includes new areas such as the People and Learning dimension. But it is a weakness as a laborious paper based system can be created to fill the gaps. The extra time needed to build a paper-based scorecard can de-motivate staff. Firstly, make it as simple as possible for staff to build the scorecard and secondly, make it easy for staff to drill down and see the true causes of adverse or positive performance revealed by the scorecard measures. I usually start by helping a business unit to build an Excel model that produces the scorecard with minimal user intervention, by drawing in data in Excel format from disparate systems across the organisation. The model also allows users to quickly drill down, forecast and see where the real issues are. Far from being a paper chase it is a hands-on problem solving tool. And being a problem solving tool helps gain acceptance. Include all stakeholders. Don’t implement the concept in one or two Head Office areas only for example. Far too many Balanced Scorecard attempts fail to trickle down the organisational hierarchy. To work, you must build a hierarchy of scorecards, reflecting the structure of your organisation and how it adds value to the customer. Remember that over a decade has passed since the scorecard concept was first developed. Outsourcing and offshoring are now commonplace – ensure that these value generating operations are included too. And by the way, when considering measures for the customer dimension, involve the customer. It’s the customer’s definition of excellent service that matters – not yours. Some call this the “Three Es of Success”. Give people the training, give people the authority to create their own business area Balanced Scorecards. Inter-act with the implementation teams to demonstrate the importance of the Balanced Scorecard project. Any Balanced Scorecard project will fail if it is seen as just another “management fad”. It needs sponsorship through active communication – communication that explains why the organisation needs the Balanced Scorecard and how it will benefit both teams and individuals. Many Balanced Scorecard users are weak on analysis. Devote training and resource to the analysis of reported performance information, particularly trends. Most organisations don’t. Don’t forget the strategy process. I am now going to repeat myself. The scorecard is not a stand-alone process. It must feed into and be driven by your strategy process. And this is not just an after thought. Updating you scorecards is not just an issue of slotting in new financial targets to match next year’s budget or taking an arbitrary 5% off the staff turnover rate. Every organisation’s strategy changes to a degree each year and so should each element of the scorecard. Illustration 3 below gives examples of some of the questions you should be asking when going through the annual strategy process. Notice this time how the action moves downwards from the financial plan. Answering these questions will help you identify actions, objectives and new measures in each of the scorecard dimensions. The output is a series of actions need to reach the financial plan objectives. This questioning must be part of your business planning cycle. Omission is a common failing, but with this questioning process there could be a disjointed relationship between your scorecard measures and what you really want to achieve. Devote resource to retesting correlations between measures and (a) desired behaviour, (b) attainment of objectives and (c) financial outcomes. As we have illustrated in this briefing, poorly conceived measures deliver the wrong behaviour. Some elements of the Balanced Scorecard will rely upon survey type questionnaires – such as culture and customer satisfaction measures. The problem is that the repeated use of “tired” questionnaires produces inaccurate results. People just get bored of answering the same questions. So think about new approaches. This is the second of the three question presented on the first page of this briefing. Based on the observations discussed above, you will find below a questionnaire that may help you score the state of health of your performance measurement project. Examining the results is easy – focus on where your answers are in the red and orange sections. * Not giving the project your 100% support and involvement. Hopefully, this status questionnaire will stop you from committing one of the deadly sins of performance measurement. Is the Balanced Scorecard a self-contained panacea for all management ills in the 21st century? The final question to be answered. The answer form my perspective is “no”. The Balanced Scorecard is very good at encouraging learning. It is an excellent educational tool to help staff see how financial results and shareholder value is really created. It’s a good tool to use too to help managers and teams see and define the actions needed to achieve their objectives. So it’s an excellent educational tool. It’s a good holistic performance measuring approach too, but it cannot take provide all the information an organisation needs to manage its current and future positions. Indeed, there are cases where non-executive directors have refused appointments where reporting just using a Balanced Scorecard format has been proposed. The Balanced Scorecard is a good internal scanning and assessment tool but it has real shortcomings when looking at the outside world and cannot replace a well-constructed environmental scanning system which is another essential part of any manager’s toolkit. If you enjoyed reading this …. Then please do signup for my newsletter to get my latest thoughts, ideas and research straight to your email inbox. Sign up here.